The need to obtain a visa is one of those bureaucratic necessities associated with foreign travel. Visas can be costly, both in terms of the actual price of the visa but also though the time and cost of applying for the visa and visiting the embassies where they are issued. Thailand, one of the most popular travel destinations for Chinese tourists, announced over a year ago that it would be adding China to its list of permitted visa-on-arrival countries. This means if you want to plan a visit to Thailand you no longer have to go in person to a Thai Embassy to you can get your visa when you land in Thailand, or go online ahead of your trip and obtain your visa that way. To make this even more attractive, the visa-on-arrival fee was temporarily waived through December 2018 and January 2019. Thailand joins a club which includes a number of other South East Asian countries that can be visited with a visa-on-arrival. Cambodia and Vietnam are two of these countries and, like Thailand, have seen rapid growth in Chinese tourism as well as new air services. While visa-on-arrival, visa-free travel is even better for travellers. 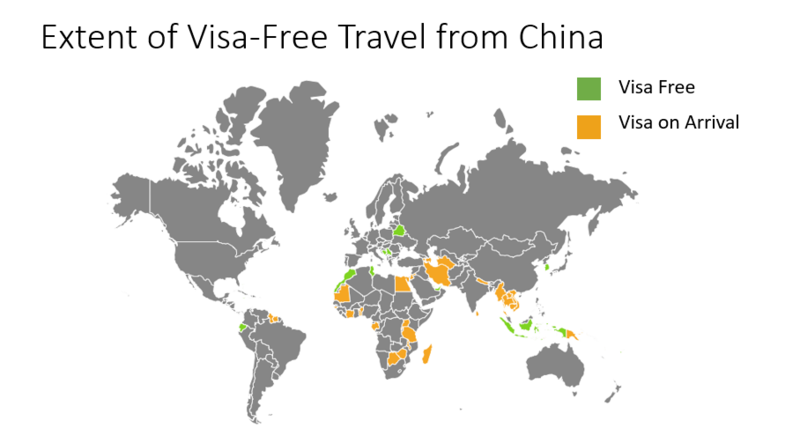 In total, there are 20 countries that offer visa-free travel for Chinese visitors, and a further 41 that have visa-on-arrival schemes in place. The role of visas cannot be understated when it comes to international travel. Our team did some analysis to see how airline bookings grew for countries with visa-free and visa-on-arrival compared to everywhere else. 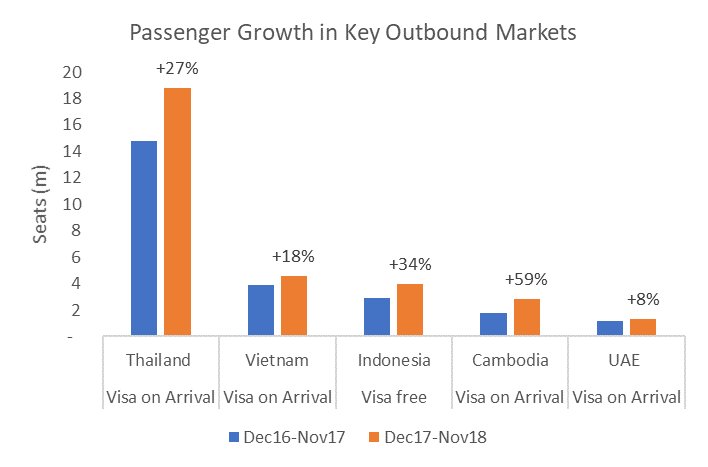 What we found was that whereas bookings grew by 10% between China and all other countries between 2017 and 2018, this rose to 17% for the visa-free countries excluding South Korea which was a bit exceptional in that traffic fell as we’ve also discussed. Overall, countries with visa on arrival saw bookings grow by a massive 41% over the same period. Unfortunately, few countries in Europe yet offer visa-on-arrival or visa free travel for Chinese visitors. However, the Schengen Visa has made travel easier and less costly since it was introduced. It provides a single visa which most of Europe which allows holders to enter and freely travel within the Schengen Area. 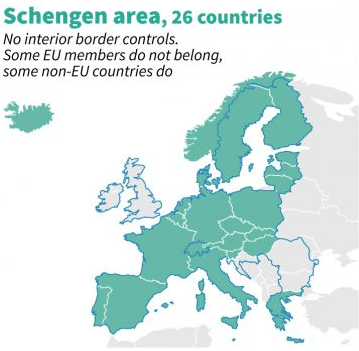 There are 26 countries that make up the Schengen Area and there are no border controls within the area. Prominently, the United Kingdom, is not part of the Schengen Area and so a separate visa is needed for visits to the UK. This has been a factor which has, perhaps, put some off visiting. Why choose to visit the UK with its requirement for a separate visa when a single Schengen visa will allow travel anywhere in 26 countries? Not all countries in the visa free or visa on arrival schemes are growing and so we’re showing a smaller group here of the countries that are growing fastest. 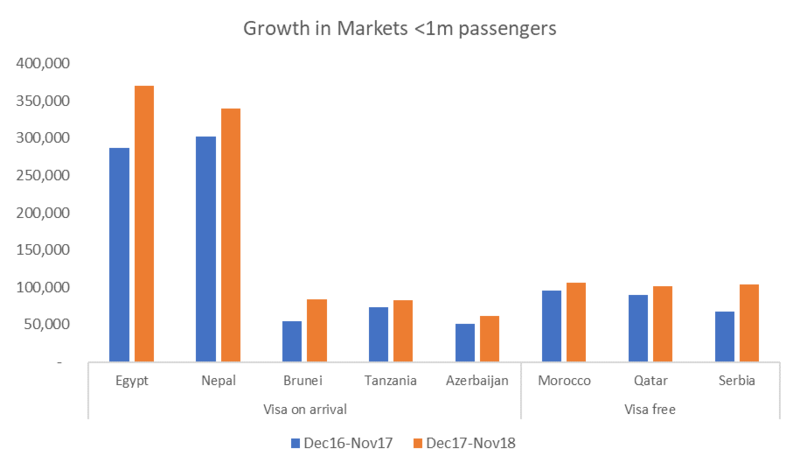 To make it easier to see the scale, we’ve split them by size, looking at countries with over 1 million passengers to and from China, and then those with markets under 1 million passengers. All five of these countries with over 1 million passengers are One Belt, One Road countries too. On average these big country markets have seen growth of 29% for the 12 months to November 2018. It’s clear that smaller markets are seeing strong growth too as shown in the chart below. These countries grew on average at 24%, with both Serbia and Brunei seeing growth of over 50% year on year. The data also shows that some of these countries, such as Morocco have no direct services from China in this period, and Serbia very little. With these kinds of annual passenger volumes, direct services could be sustainable. Egypt also is underserved, with almost as many passengers traveling indirect as are traveling direct. A good example is somewhere like Serbia, of course also a One belt, One road country, which has visa-free access. In some ways this small Eastern European country should hardly be on the radar for Chinese visitors but it is. Our data shows that there were just over 67,600 airline bookings to between China and Serbia between December 2016-November 2017 and this increased to 104,000 in 2018, up by 54%. Hainan Airlines currently operates a twice weekly service to Belgrade which stops in Prague en route. Presently, the four largest Chinese airlines have a bit over 400 aircraft in order. Assuming these aircraft are not being used to replace old aircraft in the fleet, this will add around 20-25% more capacity to these airlines. All of them have Boeing 787’s and Airbus 350’s on the orderbooks too, - about 75 in total - so it seems clear that we should expect to see more long haul air service development. Good news maybe for some European destinations?